For Christmas and birthdays, my presents from Dayv are often experiences rather than possessions. For Christmas last year, he was able to get Hamilton tickets for September. I love having things to look forward to, so although the show was nine months away, I didn't mind. Whenever we take a trip up to New York, we make a day of it, and also find a new (to us) vegan restaurant to try. Hamilton | Dayv has been obsessed with Hamilton and Lin Manuel Miranda ever since it came onto the scene a couple years ago. When Miranda was still in the show, Dayv would spend time searching for tickets that weren't ridiculously over priced and also waiting for the countdown when new tickets would become available. At one point, he was ready to hit purchase on tickets that were over $600 each, but I told him there was no one I'd want to spend that much money to see. Alas, Miranda left the show last November and Dayv was able to get these tickets with the new cast. 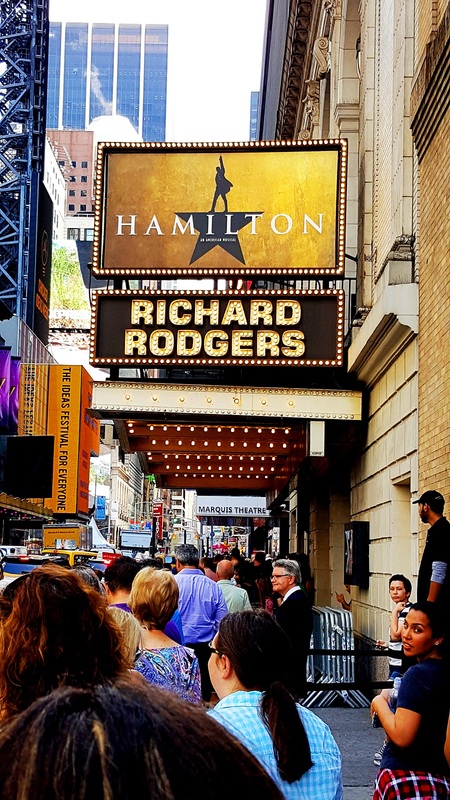 When the show started, I was immediately blown away by the opening song, "Alexander Hamilton." It is very powerful and provides the backstory for Hamilton's childhood. Overall, I was very impressed with the first half as it progressed and the song performances. I also really loved the several reprisals of Hamilton's song, "My Shot." My one critique of the first half is that, since many of the songs are rap-style, it was sometimes difficult to catch every word. The second half is when it got a little more challenging for me to follow along. The show goes into a lot of detail about the politics of the time before, during, and after the Revolutionary War, and I had a difficult time understanding what exactly was going on. For pivotal, important songs, such as, "The Room Where it Happened," I was totally lost. However, I still was able to appreciate the music and performances. I also believe the second half drags a bit, and is on the depressing side. When the show was over, I could say that, yes, I enjoyed Hamilton and totally understood the (well-deserved) hype it received and the performances were outstanding, but it was not in my Top Five. Dayv downloaded the soundtrack after we got home from the show and we have basically been listening to it nonstop. I now understand what all the songs are talking about and also read more about Hamilton's life to have more background information. I really really love a large majority of the songs (especially Alexander Hamilton, My Shot, The Schuyler Sisters, Satisfied, Wait For It, Ten Duel Commandments, Dear Theodosia, and What'd I Miss). When Hamilton comes to Philly next year, I'm sure Dayv and I will get tickets and I will enjoy it even more. Candle 79 | Dayv was so cute and made reservations super ahead of time to eat dinner at Candle 79 after seeing the Hamilton matinee. When I asked him why Candle 79, he said, "Because I know you've always wanted to eat there." I had a really bad stomachache the day we went up to New York and was not hungry when the show let out at 4:45. Therefore, we decided to walk the 50 minutes to the restaurant rather than take an Uber. I actually really love walking, especially in New York, so I enjoyed our trek. When we arrived, we were taken to our seats upstairs. I was really impressed by the design and decor of Candle 79. It reminded me of a French cafe, not that I've ever been to France, and had lots of greenery and plants. Our waiter was very helpful and refilled our water glasses often. 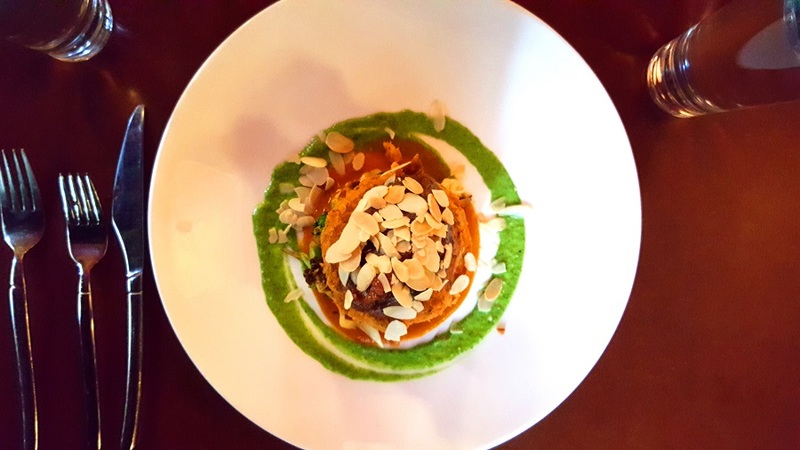 Since I was not very hungry, I only ordered a main entree of the Moroccan Chickpea Cake, although several of the appetizers and salads looked very appealing. 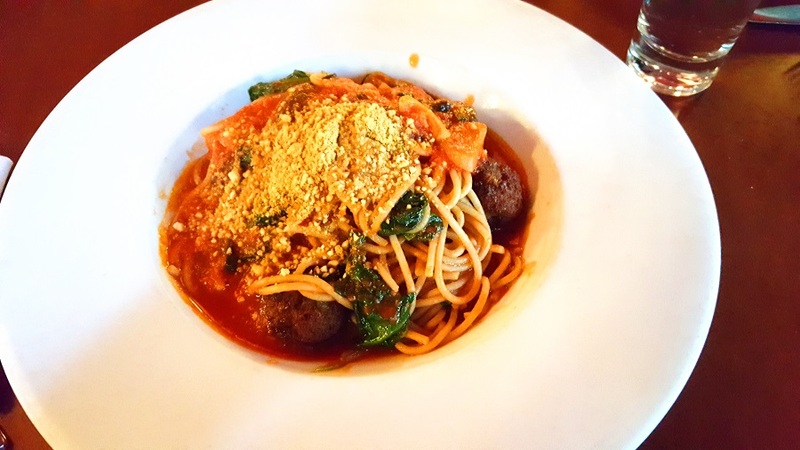 Dayv also only ordered an entree, the spaghetti and no-meat balls. 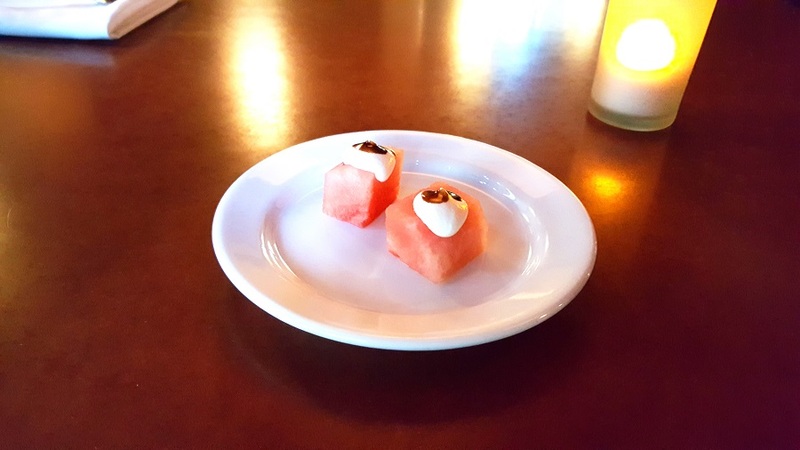 After taking our orders, we were served little cubes of watermelon with dollops of cream and balsamic vinaigrette. I found mine light and refreshing. Our dishes were served very promptly. My chickpea cake sat atop a small bed of roasted cauliflower and broccoli. The cake itself was very soft, thick, and mildly spiced. It was topped with sliced almonds. The sauce surrounding it was also mild. I really took my time enjoying it, as it was not very large. Under normal circumstances, this meal would not have big enough to satiate my appetite. Dayv also enjoyed his pasta dish and ate it all. We were both comfortably full afterwards. When all was said and done, we were only in the restaurant for about 45 minutes, which is extremely impressive. I look forward to going to Candle 79 again and being able to enjoy more of their selection. I enjoyed hearing about your trip! I have been wanting to visit Candle 79 but I don't see that in my future anytime soon...boo hiss! teehee! I want to see Hamilton at some point, but I guess I will brush up on my history first.